There she is, the Google whale on Verizon. Go get your Nexus 6 if for some reason you decided to skip on the unlocked version through Google Play, which we showed you months ago works fine on Verizon’s network. For $249 on-contract, $27.08 per month on Verizon Edge, or $649 off contract, this phone can be yours, “Verizon” logo included. 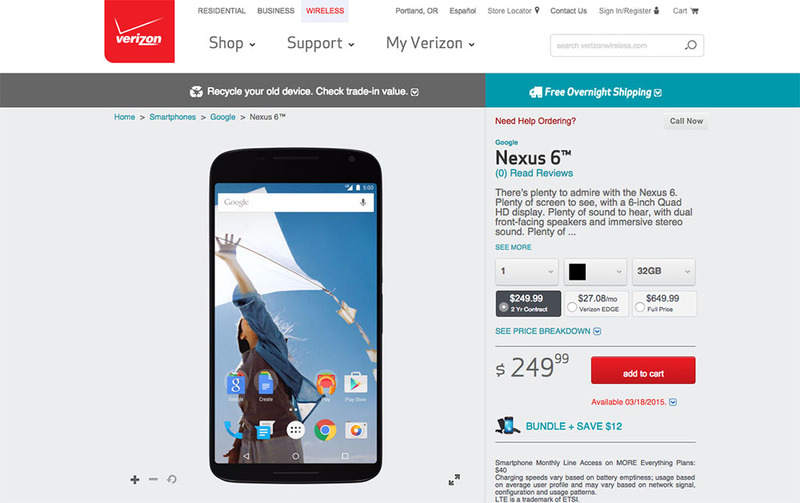 According to Verizon’s website, the Nexus 6 is essentially just up for pre-order, with an expected ship date of March 18. Be sure to read our Nexus 6 review if you haven’t already.